A recent article in CFO, “Vision Quest: Expectations for CFOs to Add Strategic Value Have Never Been Higher,” emphasized the need for every company to have a strategic CFO. This concept is not new, but the changes in the business environment for the food and beverage industry have only strengthened the case for strategic input from finance to support a growth agenda and ensure profitability. Becoming more strategic from a financial perspective has always been difficult given that most financial analysis is done in the rear view mirror, reporting on what has happened rather than influencing what could happen. Even though they are reporting on what has already happened, Finance does add value in this fashion by helping to identify and mitigate future risks. However, they typically don’t have the tools to identify potential upside opportunities. Upside identification has typically been limited to the realm of Sales, Marketing, Brand, and Product Management. More recently through advancement in Integrated Business Planning, all departments are pushed together at least once a year to balance between risk and upside when generating the next period plan. Therefore, one must ask, is their value in providing an environment where this cross department collaboration can happen on a more frequent basis? And using that model can departments like Finance participate more strategically with departments striving to find upside for the business? Generating upside opportunities by leveraging data pertaining to all aspects of a food and beverage business from inventory management to production, from customer service to billing and from vendor activities to distribution should be a team effort across all departments. Strategic CFOs can participate by analyzing this information to better understand the company’s financial upside, performance and risk. “Indeed, in KPMG’s CEO survey, three of the top five CFO initiatives thought to add the most strategic value to an organization involved financial data analysis or forecasting, with ‘achieving profitable growth through financial data analysis’ at number one,” cited Edward Teach in the Vision Quest article. In order to add value from a sales and operations perspective, the CFO must take the time to truly understand the strategic business problems that are limiting their company’s success. (Read Actionable Analytics for Food and Beverage Distributors for tips on how to evaluate the problems.) Once a CFO understands the problems, then the key is to use all available data and analytics to work with the team to identify a value prop/ROI that will meet the internal hurdles to get a budget approved for a project to capitalize on the related opportunity. In many cases systems are already deployed which can provide access to data which if properly presented as part of a dashboard or workflow will provide actionable insights designed to improve business performance. Typical data sources include ERP, CRM, Retail Management, Trade Management, Logistics, Warehouse Management, Order Management, brokers, foodservice distribution cooperatives, vendors, and manufacturers. With this many sources, it can be challenging to pull together the data into a single version of the truth. This is where a dashboard can create specific views of the business designed for the CFO. 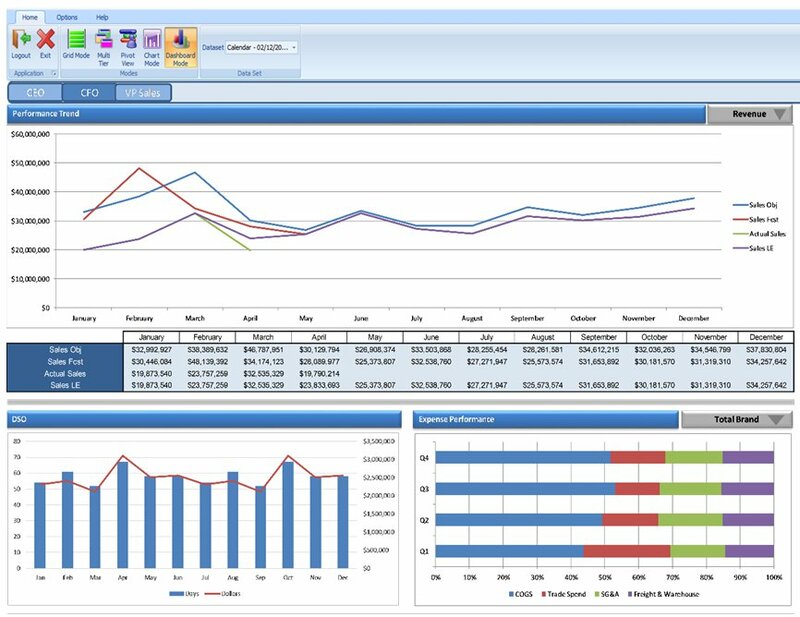 Below is an example of a dashboard that could be used by a CFO at a meat packing business. This dashboard provides visibility to volume and revenue as well as views of objectives/targets compared to forecast, actual and latest estimate. In addition, profit trends across the same metrics are key to their “health-of-the-business” analysis from a financial executive’s perspective. With this information, the CFO can provide guidance to the function heads regarding areas where they can capitalize on upside or improve efficiency. This information can also be shared with the CEO to ensure there is full understanding of how the company is performing. For more information, see our data analysis software, AFS™ G2.